WizKids is thrilled to announce Dungeons & Dragons Waterdeep: Dungeon of the Mad Mage Adventure System Board Game, the newest addition to its Dungeons & Dragons Adventure System series of board games, is available now in North American game stores! Inspired by the Dungeons & Dragons adventure of the same name, this exciting new release sees players journeying through the Yawning Portal to Undermountain to take on the creatures and quests that lie within. As always, Waterdeep: Dungeon of the Mad Mage Adventure System Board Game can be combined with the previous games in the Dungeons & Dragons Adventure System series, and Waterdeep: Dungeon of the Mad Mage Adventure System Board Game adds a variety of new and exciting features, such as the ability for players’ characters to reach level 4 and the addition of Bane/Boon cards, to make players’ adventures more epic than ever before! 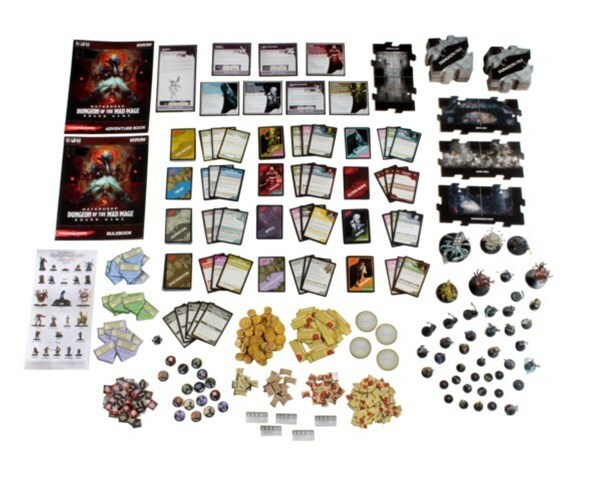 The game comes in both Standard Edition for $79.99, featuring unpainted miniatures, and Premium Edition, which includes 42 fully painted miniatures, for $159.99. Dungeons & Dragons Waterdeep: Dungeon of the Mad Mage Adventure System Board Game is available now, so venture to your Friendly Local Game Store and pick it up today!